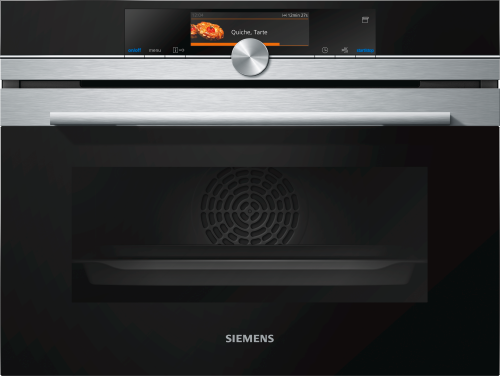 When it comes to modern ovens, you really can’t do much better than cooking with steam (as we have covered before many times) and the CS658GRS1B is one of the very best on the market today. Cooking a traditional British roast dinner? The incredibly useful pulseSteam technology featured here allows for juicy and delicious meats, and at the same time ensures that your potatoes and yorkshire puddings are crispy without being dry. As a big fan of the Sunday lunch, I for one find this feature a must have. Cooking in the dark? I don’t know you would be possessed to live life so dangerously, but if you wanted you can indeed do this thanks to the full colour TFT Touchdisplay Plus. Perfect resolution and easy to read, not to mention simple enough for a monkey. Back to the Sunday lunch; with Siemens’ roastingSensor you can detect the precise moment that meats are ready, by way of a thermometer which is inserted deep into the chicken (or whatever your preferred animal). The goes for bread products thanks to bakingSensor; the concept is much the same but by detecting moisture in the air. Clever stuff. As if that wasn’t enough, Siemens have got another awesome feature up their sleeves. Picture the scene… You’ve just finish a mammoth cooking session and are now on your knees, scrubbing away with chemicals stinging your eyes. Thanks to the special ecoClean Plus coating you will never have to experience this become a reality, as all grease and grime is now converted into a fine powder ready for a quick and easy wipe. That’s literally all it takes. Finally, the world is all about being green now. A very good thing, we hope you agree. Thanks to the CS658GRS1B’s A+ energy efficiency class, you can rest assured that you’re helping to keep this planet beautiful and prevent a Mad Max style future.